Buy Le Havre and PriceWatch, Buy this board game at the Lowest Price. 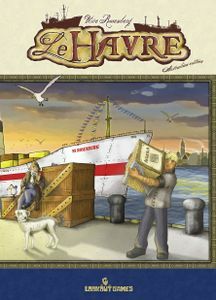 Le Havre is a construction strategy game with an economic theme designed by Uwe Rosenberg, the designer of other hit board games such as Agricola and At the Gates of Loyang. The game concepts are similar to Agricola, with the focus on obtaining and processing resources in order to feed your workers and construct buildings. The goal is also similar, that is to become the player with the strongest economic presence. In the game, you manage a harbor, build ships and construct buildings in your bid to become the merchant with the most power and the largest fortune in Le Havre, the construction and economic strategy board game. Take control of resources, process them, sell them, and turn them into food to feed your hungry workers. Construct or buy up buildings like the bank and the art center, or ships like the luxury liner to prove that you are the master of Le Havre! The setting of Le Havre is the port city of the same name located at the mouth of the river Seine on the northern coast of France, set during the Industrial Age. Your objective is to become the richest merchant in the city, and you do that by ending the game with the most cash. This can be obtained via a number of strategies, either by collecting and processing resources, shipping them off, building a merchant or luxury fleet, controlling local businesses, or any other strategy in between! Players take turns moving their ship tokens along a track of 7 spaces. Each turn, 2 basic resources are added to their respective pools, representing raw goods that have come in to port. These resources include francs, fish, wood, clay, iron, cattle, grain and more. These basic resources can also be upgraded into processed counterparts such as leather and steel as well (Yes, that is a lot of resources!). During their turn, players can do one of two things: either grab all of one type of basic resource from its pool, or send their worker to use a building. Grabbing resources is pretty straightforward: you gain raw materials that you can later use to trade, process, build buildings or feed your workers. Using buildings is a bit more complicated, and is the primary focus of the game. Buildings are either owned by a player (having either being constructed or bought by them), owned by the town council, or have yet to be constructed. A set number of buildings are semi-randomly sorted at the start of the game, with 3 of them being available for construction at any given time. There are also a couple of buildings that are available for use from the start. These buildings, such as the construction firm, are the ones you need to use to construct other buildings. These buildings have a construction cost (such as wood, clay or brick), or can be bought using francs. Once constructed, their ability can be used by sending your worker there as an action. These building abilities allow you to do a huge variety of things. In the early game, grain isn't worth much, and can't be used to feed your workers. But once the Bakehouse is constructed, it can be used to convert the grain to delicious bread. Similarly, you aren't able to build ships until the Wharf is constructed. You can use buildings belonging to other players, but you will need to pay an entry fee to the building owner, either in francs or food. This method of controlling available actions using building construction is a brilliant way of slowly easing players into the game's complexity. In other similar games, you might get information overload on all the various actions you can take… even before the game starts! In Le Havre, all you have to worry about at the start is grabbing resources and the ability to construct buildings. Every other action can be explored later as the buildings get constructed and the number of available actions slowly increases. Every 7 turns, special end-of-round events happen. A new ship becomes available to be constructed, and workers need to be fed with your available food resources. There can also be a harvest event where similar to Agricola, if you have enough grain or cattle, you get to make more grain and cattle. As the game progresses, your expanding merchant empire means you will need more and more food to feed your workers each time the end-of-round events occur. There are plenty of strategies to pursue in this game, and plenty of ways to win. The winner is the player with the highest total asset value. You could win by building a lot of buildings and accumulating your wealth that way. You could build crucial buildings and collect entry fees from other players. You could try to monopolize resources and see your opponents go into debt when they can't feed their workers. You could build a merchant fleet to export your goods. You could even build luxury liners and make your fortune that way! Le Havre is a complex and engaging board game, and is a worthy successor from the man who designed Agricola. It spans nearly a century of progress as your town grows from just a couple of huts into a full-fledged city with economic and industrial buildings. And you ships move from rickety wooden ones to iron and finally steel behemoths. Le Havre is ideal for you if you like resource management and construction games such as Agricola or Puerto Rico.